One of our goals at Benedicto is to identify products that can elevate your bikepacking experience. We tend to put a microscope to our bikes and components and luggage, but rarely do our sleep systems get such attention. It’s almost seems as if sleeping or being comfortable just isn’t cool. We only care about pedaling and getting to grand vistas. Personally, though I’m after the complete experience and I want to enjoy all of it as much as possible. Recovery is the key to enjoying a multi-day trip and that means getting good night’s rest, so you can wake up the next day and do it again without fading. Since I’m not ultra racing and sleeping as little as possible, that means a lightweight tent, sleeping pad and a comfortable sleeping bag. This year my “sleep system” has been the ZPacks Duplex for a tent, a Thermarest NeoAir XLite Mattress and the Montbell Down Hugger 900 #2 sleeping bag. Finding good shelters for bikepacking is a challenging proposition. Most backpacking tents are bulky and heavier than you want for multiday trips. So we went looking to see what ultralight thru hikers were using. One of the best options in that world is the Duplex Tent by Zpacks. 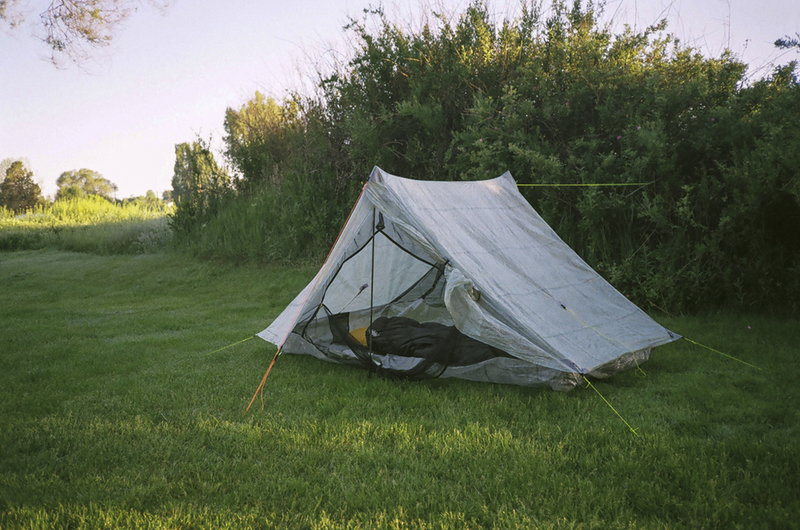 With the Duplex you get an 2-person American made cuben fiber tent that weighs in at only 21 oz. ! I started out using a 4 lb. 2-person tent. The tent was comfortable and easy to set up, but I was uncomfortable with the weight. It seemed like too much weight for just a shelter. I felt like 2 lbs. should be a maximum weight. So, I did some research and looked at what thru-hikers were using and found a guy named Joe Valesko who makes ultralight shelters out of cuben fiber. Joe’s company is called ZPacks. Cuben fiber is a bit of a miracle fabric in that it’s very strong and doesn’t stretch much and is waterproof. The only real negative is that it’s expensive. (The Duplex that I’ve been using and testing goes for $600.) I know that’s a lot of money for a single item, but if you’re looking to shed weight and still have a comfortable and reliable shelter it may be money well spent. For reference a popular tent like the Big Agnes Fly Creek UL2 retails for $350. Folks that are investing in a long trip such as CDT or TAT would benefit greatly. And keep in mind too that ZPacks is making their shelters to order and they’re made by hand. Your money is going to materials and workmanship, not marketing. Thru-hikers will use trekking poles to pitch their Duplex. Bikepackers will use two 48 inch carbon fiber poles (another $59 to the overall price) I also bring six titanium stakes. Aside from the two carbon poles, you must stake out the tent to keep it aloft. The down side there is that the tent’s overall footprint is large and it’s not as simple to tuck the tent into a small space. If you’re curious, you should watch their YouTube video: It takes a bit of practice to get the shape of tent just right. But once you get it down, the Duplex is spacious and sets up quickly. I love that the tent has doors on both sides and creates a vestibule on both sides where you can keep dirty shoes. The tent’s design has you covered during bug season since the bathtub floor connects to the fly with ultralight insect netting. The big issue with bivvies and single wall shelters is condensation. If the weather is good enough the simple solution is to keep the shelter as open as possible. 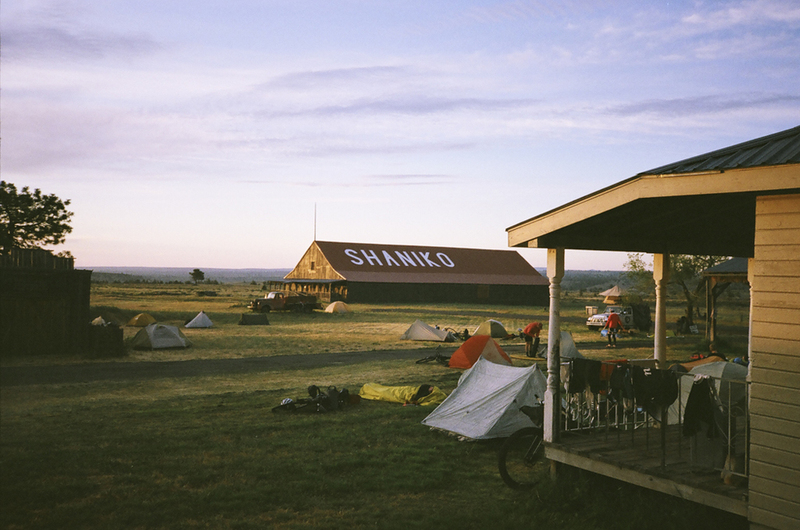 On the Oregon Outback I had one windy night in Shaniko where wind whipped through the tent, but it wasn’t unpleasant or cold. The night before in Prineville was colder, so I kept the tent closed up and ended up with quite a bit of condensation inside the tent. I think perhaps this is just the nature of ultralight single wall tents and you just learn how to use the equipment as it’s intended. There will always be tradeoffs with ultralight gear, but I feel like this shelter is extremely versatile and well designed for 3-season use. 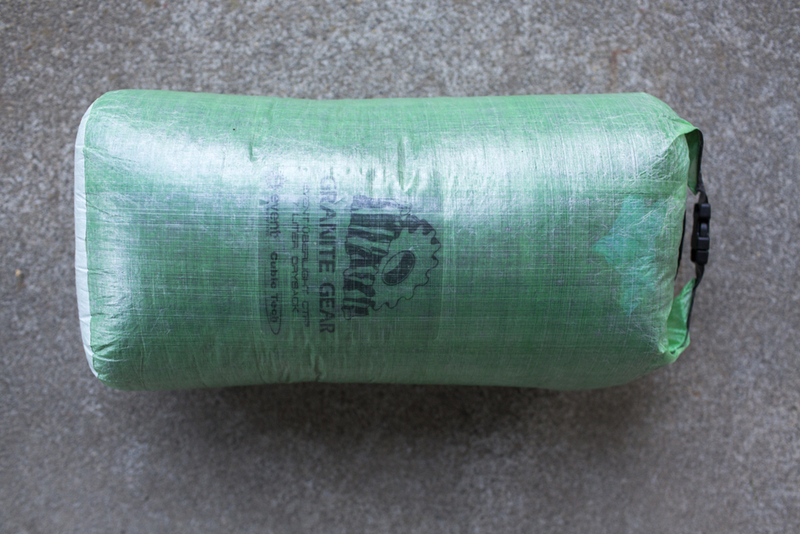 Overall weight including the stuff sack, carbon poles, and 6 stakes is 27 ounces (1 lb, 11 oz.) That’s pretty amazing for a handmade ultralight shelter. Packability is pretty good – about 14 inches long and 6.5 inches wide. The ordering process was simple and turnaround was quick. I emailed directly with Joe and communication was great. Anyone looking for a lightweight shelter should talk to Joe at ZPacks. 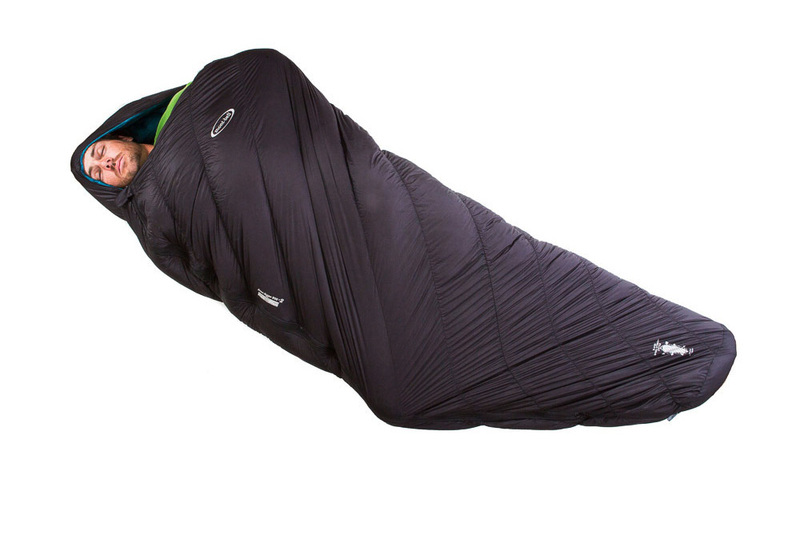 They also make good looking bivvies, sleeping bags, and packs. UPDATE 12/2/15: ZPacks has introuduced an updated pole system called Duplex Flex that allows the tent to be pitched more easily in tighter spaces. The update will cost $155 if you already have a Duplex that you'd like upgraded. All Duplex tents made after 11/15/15 will have attachment points for the FLEX upgrade. Compressed size 5.9 x 11.7 in. 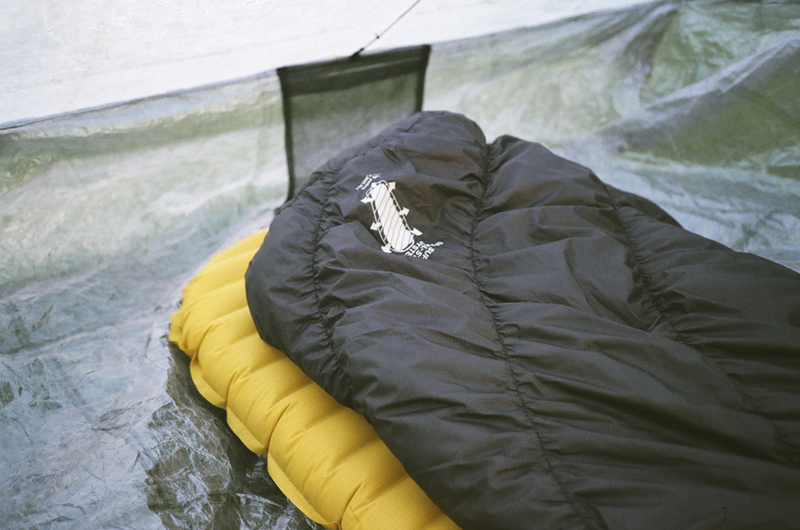 For the most part backpackers sleeping bags pretty much all look the same – mummy bag with nylon shell and quilted baffles. There are great choices out there and most are fairly comfortable and will keep you warm. But how comfortable are you really in a mummy bag? In the past you maybe had a comfortable non-mummy bag for car camping and your sleek, stripped down lightweight bag for backpacking or bikepacking. Few of us really sleep on our backs like a mummy, especially after a full day of pedaling my bike. My muscles ache and I tend to wriggle around in search of rest and a comfortable position for my body. Usually I’m a side-sleeper. I’ve also done enough trips this year in a variety of temperatures to know that being too cold can be miserable and makes me grumpy the next day. Also, it’s worth talking about those EN ratings. When a bag is rated to 40, it generally means you can use it on 40 degree nights, but it’s real sweet spot is a 50 degree night. So, if you want to be comfortable on a 35 degree night, which is pretty common in Oregon, you want a bag rated to 25 degrees. There is a lot you can do with warmer pads and adding clothing, but that’s my rough guide based on the numbers. 10 degress above the rating is the bag’s sweet spot. Montbell has become a favorite company for me since they seem to be able to offer high quality, lightweight products for a really reasonable price. Also, they just opened up a retail store in Portland, so we can go try on and drool over their amazing products. 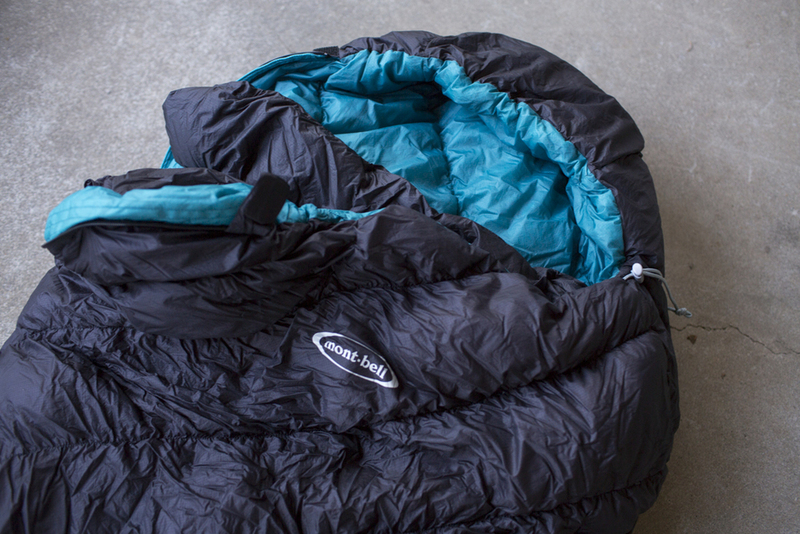 Their down jackets are amazingly warm and light and pack down super small. Based on that I was excited to see if their sleeping bags lived up to the standard of their down jackets. Enter the Montbell Down Hugger. This bag is truly unique in that it flexes with you while you sleep. If you bring your legs up in any kind of fetal position, as most side sleepers do, you’re not constricted by your mummy bag. How did Montbell accomplish this trick? 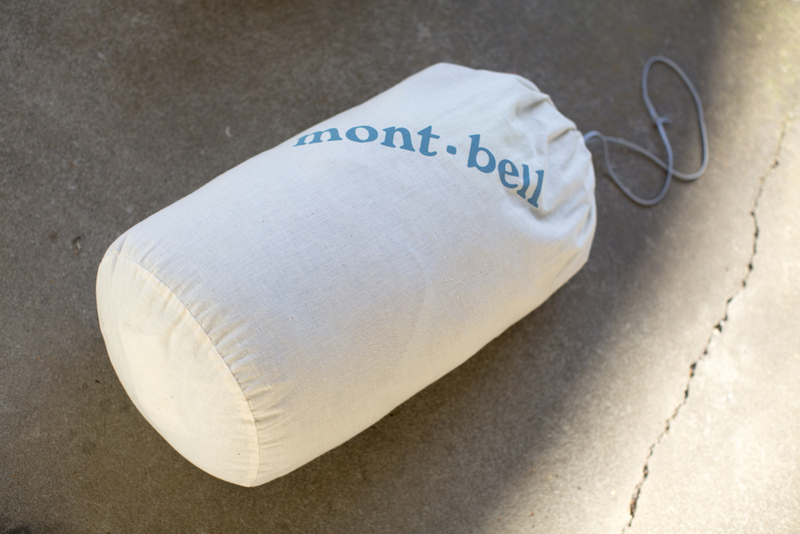 Montbell says this of their Down Hugger bag: “We found that integrating a woven fabric "cut on the bias" and orienting the fabric's warp and weft threads at 45 degrees to most major seam lines the sleeping bag becomes more fluid in nature. To create an even more comfortable system we utilize an elasticized thread in the stitch to create small "gathers" in the quilting. Through the combination of strategic seam orientation and the stretch provided by gathered quilting we offer unrivaled fit and comfort.” Based on my own experience with the bag in a range of temperatures, I’d say this is not hyperbole and is completely accurate. This is a bag that is warm and extremely comfortable. It’s a bag that I can’t wait to crawl into. It’s just that comfortable. At first I thought a 25 degree bag would be too warm, but it’s not even on warmer nights the bag breathes well enough, that you just have to dress accordingly and skip the long underwear to be comfortable. A note about pads for side sleepers – the wide pads tend be better for me. The bag is plenty packable and these days when bikepacking, I stuff the bag in a 7Liter Granite Gear eVent Uberlight stuff sack. The Uberlight will keep your bag dry while you're pedaling and the eVent fabric lets air out, so compression is simple. Speaking of mattresses, I’ve been testing two pads recently – The Thermarest NeoAir XLite and the Thermarest NeoAir XTherm. 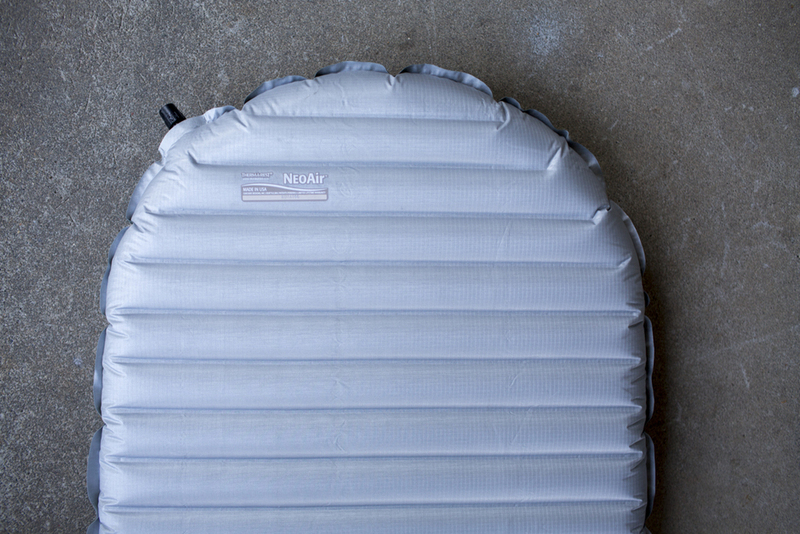 The XLite is an easy choice, since it’s super comfortable, packable, and weighs only 12 oz. It’s made in the USA – most likely in Seattle. For most adventures it’s been my mattress pad of choice. It fits easily in my Revelate sweet roll along with my tent and sleeping bag. So, if the XLite is such a great pad, then why use the XTherm? Well, The XTherm is more durable and it gives extra warmth. So when you check the forecast and the low temps are pushing the edge of your bag’s comfort zone, grab the XTherm. In one case I stuck with my 40 degree bag and grabbed the XTherm. I was colder than I like, but warmer than I would have been without that mattress. That’s the discussion, I suppose. How much comfort are you willing to trade for lightweight gear? For some, it’s just a matter of cutting our packing list down to the bare essentials. Could you go with a ¾ length pad instead of full length? 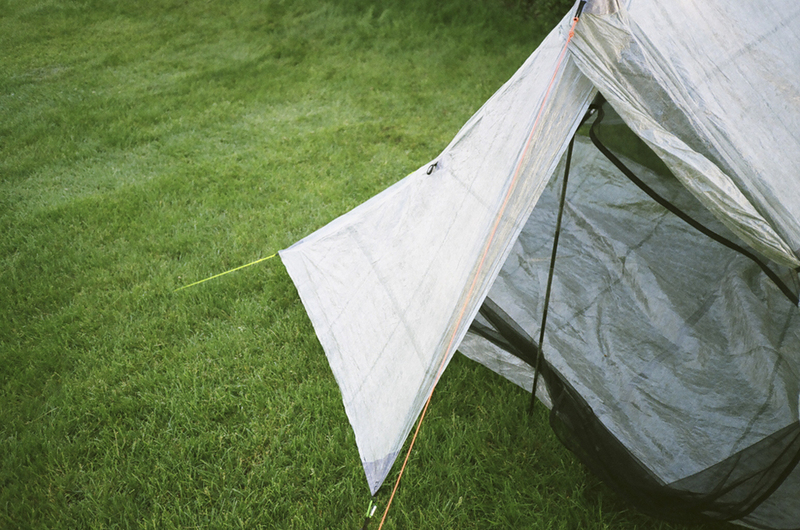 Could you use a tarp instead of a tent? Could you sleep under the stars and not bring a shelter at all? When weather is at all threatening, it’s usually best to bring everything you think you’ll need. That goes with cold as well. When in doubt, I’ll carry the extra 5 oz. if it means I’ll be more comfortable at night. 5 oz. is the difference between my standard width XLite and my Wide XTherm. And if I’m car camping, I’m bringing the Thermarest Deluxe XL. That pad is almost as comfortable as a bed, and paired with the Montbell Down Hugger bag, that’s as good as it gets for sleeping outside. So far I’m true to Thermarest, but I know there are a lot of lightweight options out there these days. I’m curious what other people are using. I trust the Thermarests and have had zero problems, so I’ll stick with them for now.